Since I am once again on business travel, I thought I would finish up with the FINAL day of my trip report from San Francisco from Thanksgiving 2010. Monday: The LAST day. We have been touring pretty hard, if we were staying any longer, we would have to take at least this afternoon off to rest. But instead we will be getting on a plane, so we better fit in some fun this morning. 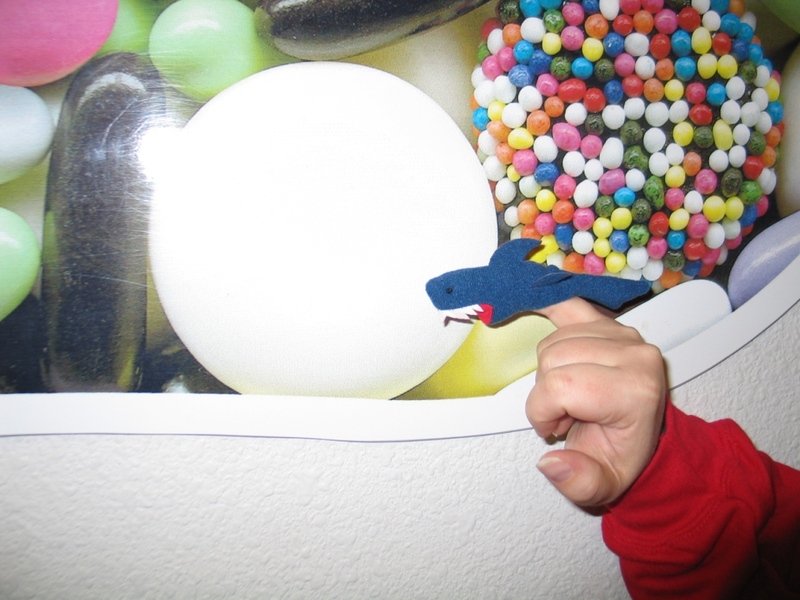 The most exciting moment of the morning – April found Bruce the shark finger puppet! He was between the seat and the door in the back seat of the car. It is amazing that he didn’t fall out, he had at least seven opportunities. Just shows that he loves me and wanted to stick around even though I dropped him out of my pocket. Bruce went with us the rest of the day, riding in my sweatshirt pocket, when he wasn’t on my finger making comments. We got on the road for Fairfield, home of the Jelly Belly factory. I love me some Jelly Bellies, so I was very excited to do this. NEXT time we will do wine country, this time I wanted to see Jelly Bellies. Nick and April had done this tour before, but never on a week day, so they were interested to see if there would be actual workers in the factory. 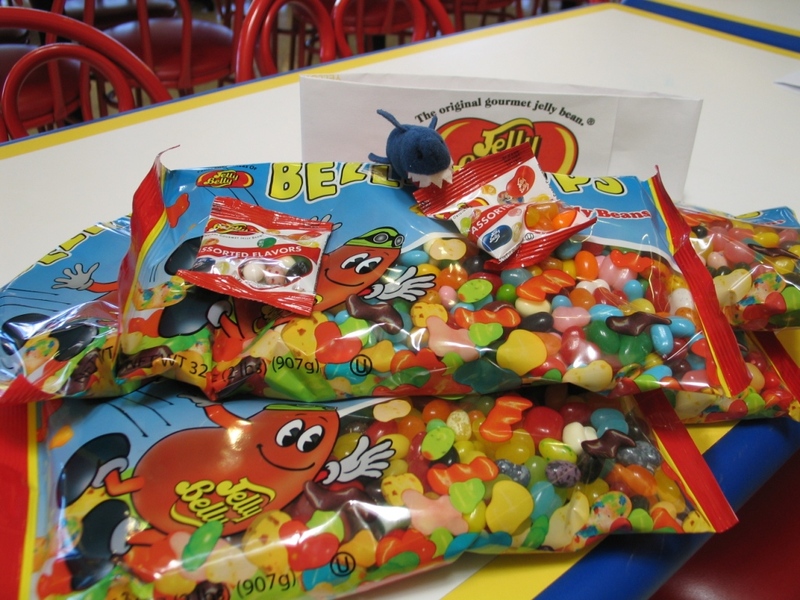 Bruce the Shark loves Jelly Bellies almost as much as I do. We got there and had to wait about 15 minutes for our tour. This time was spent sampling Jelly Bellies, of course, they have a sample bar where you can try one of any kind you want. They have these NASTY flavors (Bean Boozled) that are a take off on Bertie Bott’s Every Flavored Beans, and April was just insistent that we each had to try one. I think Ken got the best end of the stick, with pencil dust, I tried centipede, Nick tried baby wipe, and April tried canned dog food, which made her dance and hop and exclaim about how bad it was and how it tasted JUST LIKE dog food smells. Well, don’t eat it then! We had to drive the tastes out of our mouth with some normal jelly beans. Having a burp later that tasted like centipede was not very pleasant, however. Bruce was really hoping for a Human Flesh flavored Jelly Belly but no such luck. The tour is very interesting and fun. No pictures allowed in the factory, so no documentation of that. They were making Buttered Popcorn flavored beans that day, so the factory smelled of buttered popcorn, and April hates that flavor and I love it. We got to sample the Jelly Bellies in the different stages: in the Pupa stage as I would call it, when they are just soft jelly, then with the candy coating but not polished, and then all polished of course. We got to try their new flavor for Christmas, which was Candy Cane, which tasted like, well, a Candy Cane. Like a strong mint gum drop, nothing to write home about. I tried a birthday cake one at the sample bar that was my favorite new flavor. The tour took about 40 minutes, and at the end, you got two tiny bags of Jelly Bellies and one of Christmas candy corn. They make all kinds of candy there at the factory besides Jelly Bellies. Bruce says why fool around with those little tiny bags of Jelly Bellies? Then: shopping! They had showed us on the tour the sorting machine which sifts out all of the Jelly Bellies that are too big, too small, weirdly shaped, etc. (I was telling Ken earlier in the day that you could get a good deal on the malformed ones, except he thought I was saying mouth-warmed ones, and he wondered why I would want that.) So they have these “Belly Flops” in 2 pound bags in the shop, and they were on sale for 5 bags for $30. So of course I had to have 5 bags! There was some debate as to whether this purchase, along with my rock collection and olive oil, was going to put us over our weight limit for luggage. Then back home to Richmond for one last meal together: Leftover Thanksgiving – Nick and April were bemoaning how long they were going to have to eat turkey sandwiches, so we tried to help them out with that as much as possible. We crammed everything into the suitcases and were on our merry way back to Colorado. 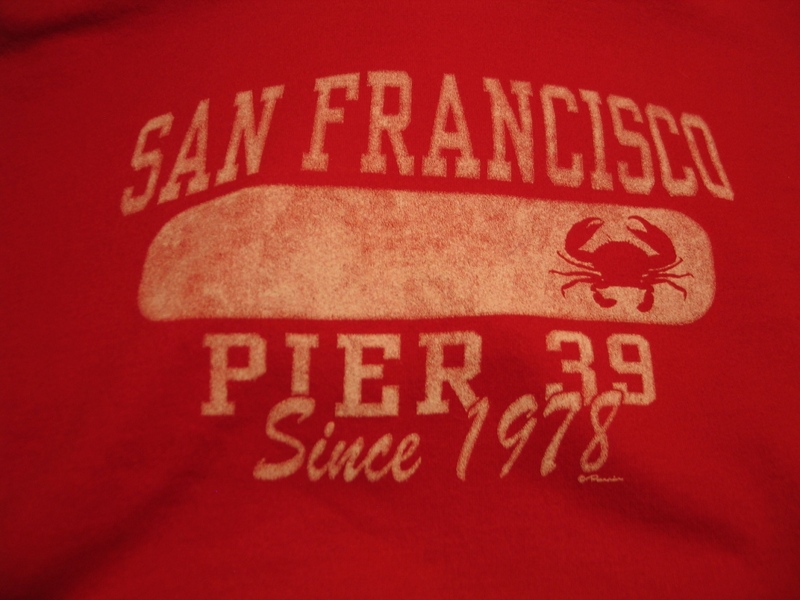 This is my awesome crabby sweatshirt I got at Pier 39. No problems at security, although Kenny did get to go through the naked scanner (this was a novelty at the time), but only because the woman in front of use (again) had a million pieces of jewelry on, and she got pulled aside for the full pat down, so that put our line behind, and they were running people through the naked scanner to reduce the line. We got on the plane, and Kenny pretty much passed out and slept most of the way. Full flight again, but not as many screaming children. I finished reading the book that I didn’t like and that was mostly annoying to me, because I didn’t have anything else to read and it was really too crowded to knit. Landed at DIA and opened up our bags and got out the heavy coats again. 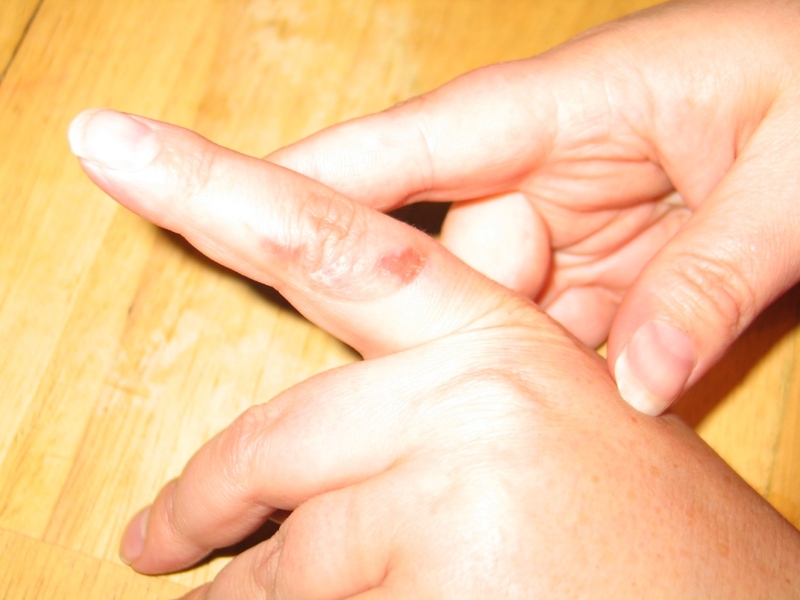 Remember how I said I burned my finger with my curling iron on the morning we got up at 5:00 a.m. to leave? Best last part of the trip: We were getting off of the shuttle bus at the extended parking lot at DIA, and this approximately 9 year old boy was looking at our largest suitcase. “That looks heavy,” he said, as we were dragging it off of the bus. “It should,” I said, “It has 10 pounds of jelly beans in it.” The look on his face: priceless. “Ten pounds of jelly beans?????!!! !” I could tell he wished he had been on vacation with US! This entry was posted in San Francisco Trip Report 2010, Travel and tagged San Francisco travel, travel by glenderella. Bookmark the permalink. I was waiting to hear if Bruce the shark, um, resurfaced. Glad to hear that he was found. Ummm, jelly beans! You could have sent your favorite Minnesota uncle some! You have such fun on your trips!